There’s nothing else quite like the UN65D8000 TV and its barely visible bezel. The TV makes a big visual statement whether it is turned on or not. Samsung D8000 series information: The review of the Samsung 65-inch UN65D8000 is based on our hands-on experience with the 55-inch UN55D8000 set. 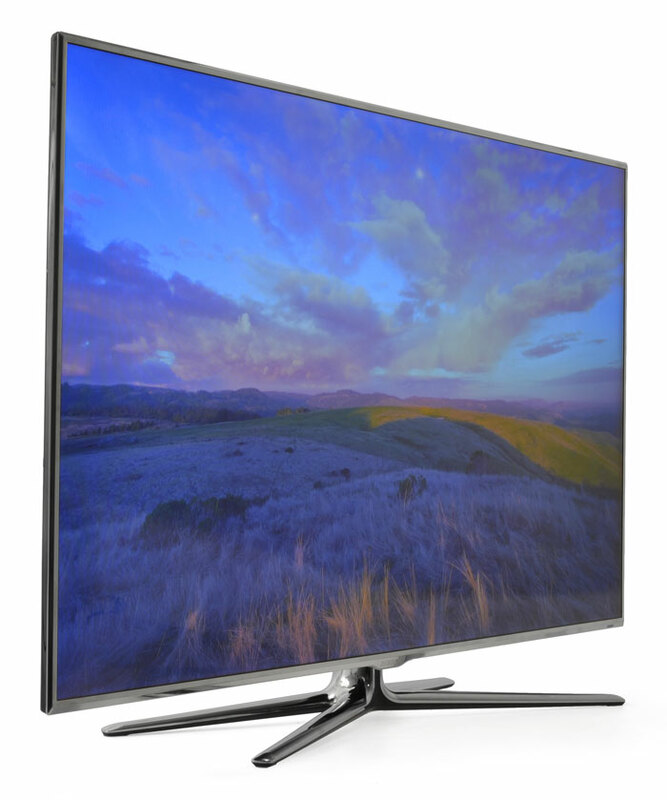 Our observations apply across the board with the D8000 series of LED TVs from Samsung. This includes the 46-inch UN46D8000 and the 60-inch UN60D8000. According to Samsung, the four TVs have the same specifications (except weight and dimensions) and should offer similar performances. Those who have watched any amount of TV or recently browsed the TV aisles of their local big box electronics store have probably run across Samsung’s D8000 series sometime or another. It’s kind of hard to miss, due in no small part to its almost non-existent bezel and wafer-thin dimensions. In fact, we’ve come to find the D8000 is like the Medusa of TVs. You can’t not look at it and, once you do, you get stuck there staring at it, mouth agape, likely for hours on end. Here’s the rub, though: Anything that draws that much attention to itself is just begging for scrutiny. One is more likely to notice the little imperfections that can go overlooked on a less-than-captivating display. Hey, that’s the price you pay for being marvelously good looking. That being the case, you might be wondering if the D8000 is a legit performer or just another tarted up piece of eye candy with hidden flaws just like everything else. Read on to find out what we think after spending some quality time with the UN65D8000 from Samsung. The UN65D8000 weighs in at just 35.7 lbs. without its stand (41 lbs with) and measures 48.5 (W) x 27.8 (H) x 1.2 (D) inches. That’s right, just 1.2 inches deep. Pulling this TV from its box is a two-person proposition. There’s not a whole lot to grab onto, so buyers will want a friend on hand to help get the TV set up. In the box with the TV is a chrome(ish) stand in the shape of a large, compressed “X”, a two-sided remote control, and the an assortment of paperwork (no paper manual, though-it’s built right into the TV). Best of all, two pair of active 3D glasses are included with each TV. Well done, Samsung! Setting the TV up on its stand was fairly easy, and we appreciated that the TV sat more securely on its stand than we’ve noted with competing models. Our only complaint with the stand is that it is not on par with the rest of the TV in terms of build quality. The stand mimics the chrome bezel’s appearance, but while the bezel of the TV is made of solid-feeling metal, the stand is made of rather cheap-feeling plastic with a chrome finish that seems like it could peel off should it take any scratches. Speaking of the bezel, it appears even smaller in real life than it does in photos and on TV. Having seen plenty of Samsung’s televised adverts for this model, we knew what to expect out of the D8000, but we’re here to tell you that you simply can’t wrap your head around how super thin the bezel is until you see it for yourself up close and personal. It’s a real looker, even turned off. Turning it on takes the effect to the next level. This thing even makes white video noise (snow) look impressive. The super-thin bezel is broken up by an illuminated Samsung badge located at the bottom center of the TV. The badge is extremely bright by default, somewhat usurping the bezel’s disappearing act. Thankfully, the light can be dimmed. We turned ours off completely. 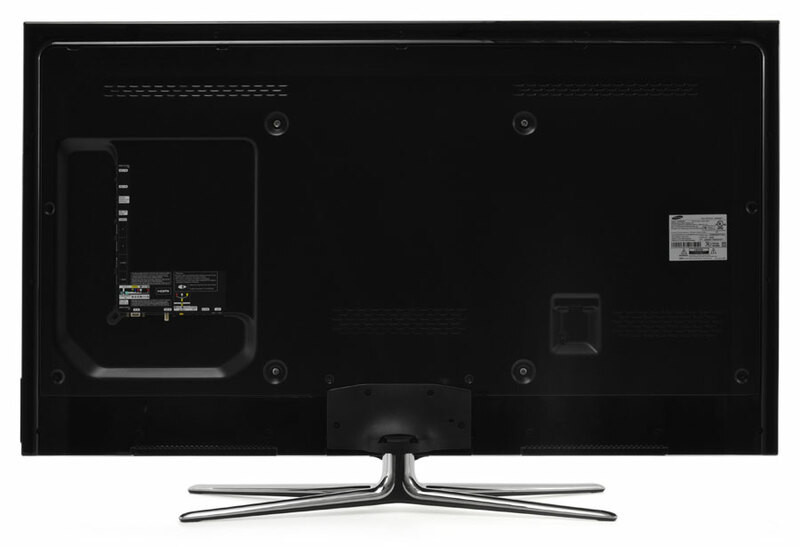 On the back of the TV is a very shallow inset that accommodates the TV’s only bay of inputs and outputs. One of the drawbacks of designing such a slim TV is that you run out of space to put stuff… like inputs. For the D8000, this means connecting HDMI cables is a little challenging. More frustratingly, those connections become more or less inaccessible when wall mounted. That includes the three USB ports which would probably need to be accessed after the TV is installed on the wall. Certainly not one of the D8000’s better design points. The D8000 series are what you would call “loaded” TVs. They sport all of Samsung’s latest technology and features. It would be impossible to cover them all, so we’re just going to hit some of the really important ones. Micro Dimming Plus is Samsung’s proprietary flavor of local dimming. For those not familiar, local dimming allows for sections of the backlight (in this case LEDs) to be dimmed while others are left to shine at full brightness. 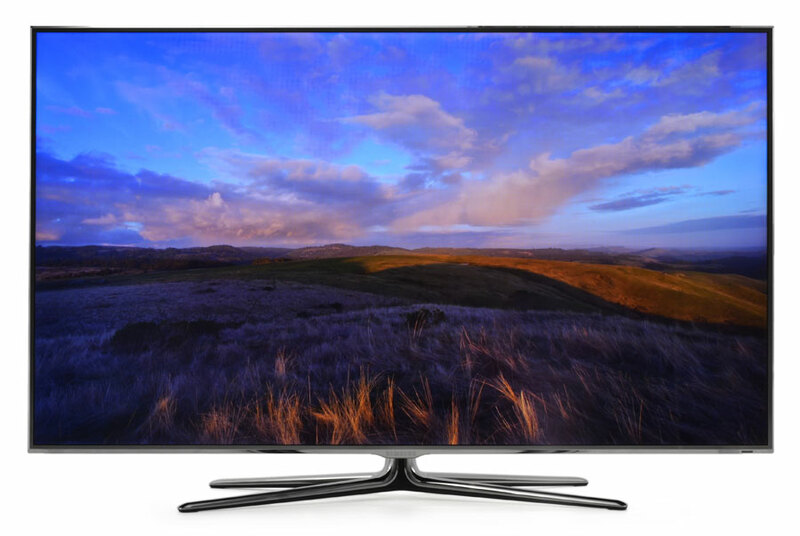 This allows the TV to offer better contrast and brightness and is most noticeable when viewing dark backgrounds with bright areas interjected into the picture. On lesser sets, the area around the bright spots will be gray or even dark blue instead of black. With local dimming, a more accurate picture is possible. While some manufacturers choose to make their top of the line models backlit for better light control, Samsung has opted to take an edgelit approach and, to take that a step further, Samsung has chosen to place the edge lighting along the left- and right-hand sides of the TV, rather than along the top and bottom edges. In theory, this should allow for letterbox bars to be darker and more uniform. The D8000 displays 3D in full 1080p resolution, and includes built-in 2D-to-3D conversion, a feature we’ve never had much use for. We’ve yet to witness it do anything but smudge up a perfectly good 2D picture. Samsung’s Smart Hub is a one-stop destination for accessing all things Internet. This makes Netflix, Hulu Plus, YouTube, V-tuner, Facebook, Twitter and a long list of other apps easily accessible from a centralized screen with an integrated search feature. We really liked Smart Hub, especially since it allowed us to keep watching whatever we were viewing before choosing to pull it up, but we were a little disappointed to find out that the search feature did not extend to Netflix, too. AllShare is essentially Samsung’s proprietary name for DLNA compatibility, but we found it to be faster and easier to use than the DLNA interfaces we’re used to. As with all DLNA devices, you can stream files from networked devices like your PC, phone, tablet and so on. The difference is AllShare makes it easier. Using our Galaxy Tab as a remote, for instance, we were able to access media not just from the Tab, but from every other DLNA-compliant device in the office, including three individual computers and all of their collective content, then choose to stream that content to the TV or any other AllShare-enabled device. We could even compose playlists on the fly. Compared to the lethargic and rudimentary DLNA process we’re used to (that involves hunting and pecking through media folders with a stripped down user interface), AllShare was like a breath of fresh air. In our opinion, this is one of the most often overlooked features of Samsung’s latest devices. Of course, this kind of media sharing isn’t available without network connectivity. The D8000 TVs give you the choice of a wired Ethernet connection via LAN port or built-in 802.11b/g/n wireless adapter. Samsung promotes its Ultra Clear Panel as being resistant to the effects of ambient light. The idea is that the panel “absorbs” bright lights in order to minimize wash-out and keep the picture looking clear. While we’ve seen worse, our 55-inch review sample was anything but reflection free. There’s simply too much surface area available for reflecting light coming through windows. Granted, our bright testing room has three over-sized windows spanning an entire 24-foot wall and our review sample was placed directly opposite those windows. So, it was under some pretty extreme conditions that we made our observations. The D8000 makes every conceivable picture adjustment available to the common user. Often, the more advanced settings are under lockdown and only accessible by certified technicians. That Samsung has made them freely available can be looked on as either a blessing or a curse, depending on your point of view. For those adventurous enough to investigate and implement recommended settings at a very granular level, the ability to achieve a finely tuned picture is great. For average users, though, such detailed controls offer more opportunity for screwing something up. At least there’s a reset option. Before we set about calibrating the UN65D8000, we took some time evaluating its out-of-the-box performance. We’re used to pretty average out-of-box performance levels, with calibration yielding somewhere between very good to excellent end results. With the UN65D8000, we felt that the out-of-box picture quality was a little below par. We attribute this to the default settings for the set’s “standard”, “dynamic”, “natural” and “movie” picture modes. For all but the movie setting, the backlight, brightness and contrast settings are pretty much maxed out and the colors a bit overblown. Movie mode was more tame, but seemed a little muted and perhaps a bit foggy. Fortunately, a little bit of basic adjustment went a long way toward wrangling the picture toward our liking. A full calibration using our Spears and Munsil test disc as a guide yielded excellent results. Colors were much more accurate, but remained vivid. The balance between brightness and contrast was much improved, as well. With calibration complete, we continued our dark-room testing by watching a few Blu-ray discs, some broadcast HD TV, Hulu Plus HD tv shows and some Netflix HD streaming movies. While viewing Avatar we noticed some incredible texture detail in the skin of both the humans and the Na’vi. This film is loaded with different shades of blue and green and the UN65D8000 did well reproducing all of them, showing off even the most subtle differences in hue. Foggy scenes went by without blatantly obvious banding, perhaps better than we’ve seen from any other TV in this respect. Without assistance from the TV’s motion smoothing circuitry, we felt motion was smooth and natural, with a minimum of judder and little motion blur. With the set’s lowest level of motion smoothing engaged, the display seemed to slightly tighten up fast moving scenes without imposing so much processing that it began to look like a cheap soap opera. 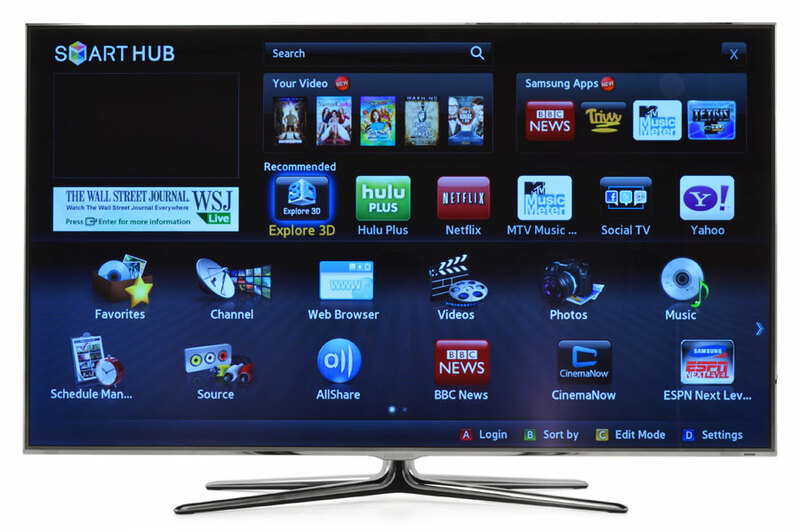 We were impressed with the UN65D8000’s superior rendering of Netflix and Hulu Plus media. The HD versions of some of our favorite TV shows looked smooth and well resolved — much better than what we’ve seen with other smart TVs. We also liked the informational interface bar which let us know that we were viewing in HD or standard definition, depending on our bandwidth at the time. With Hulu Plus, we were even able to make bitrate changes that allowed us to keep watching in HD, even though our streaming speed had slowed down. 3D performance was very good. We didn’t notice much crosstalk, which has been a problem in earlier Samsung models, and felt like color shone through the tinted, active 3D glasses. The display issued confirmations when our glasses were connected and let us know when 3D content was sensed. Though we’re not huge fans of active 3D, we did feel that the UN65D8000 provided a 3D picture with depth that was easy to come by. Often, we have to force ourselves to relax into the picture. Somehow, we felt it was just easier to watch 3D on this TV. Perhaps the bezel has something to do with it. Ah yes, that thin bezel? It really does something to bring the picture alive in 2D mode as well. Without an obvious border, the TV takes on a window-like quality that is a lot of fun to behold. But, for all that this TV does well, there’s one rather big problem: screen uniformity. In the world of consumer electronics, groundbreaking design often crashes headlong into that dirtiest of notions: compromise. As is often the case with building speakers and audio electronics, a series of trade-offs must be made when making ridiculously slim TVs. You can have this, but you have to give up that. That’s life. For now, anyway. In this case of this TV, the trade-off for having such an extremely thin bezel and 1.2-inch depth is screen uniformity. That is, the screen is noticeably brighter along its left and right edges than it is in the rest of the screen. The higher the backlight setting, the more obvious this effect becomes. We noticed it in both our dark and bright rooms, and just couldn’t get over it. The more we just tried to watch TV, the more we saw the bright, 3-inch thick bands running along the left and right hand side. Of course, we look at TVs and scrutinize them every day. It is quite likely that this issue could go unnoticed by many, and for some, the breathtaking design and otherwise solid picture quality will trump the uniformity problems. Just know that those bright bands are there, and if you are the sort that doesn’t let go of the small stuff easily, you might find them to be a dealbreaker. A quick note about the remote: We love it. It feels terrific in your hand, has great tactile feedback, is well laid out and provides a full QWERTY keyboard that connects to the TV via Bluetooth. 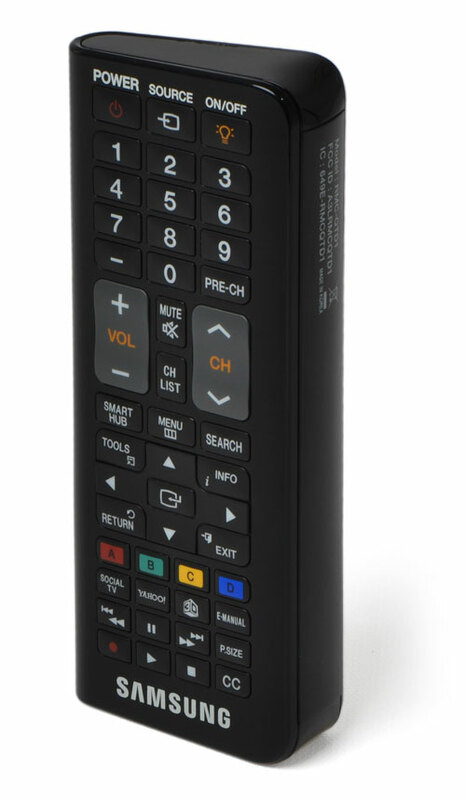 We wish the remote’s backlight stayed on for more than two seconds and worked on the QWERTY side, but at least the more commonly used functions will be illuminated when needed. There’s nothing else quite like the UN65D8000 TV and its barely visible bezel. The TV makes a big visual statement whether it is turned on or not, and when it is turned on, the sense of depth you get when watching is a special kind of entertainment unto itself. Unfortunately, in order to make such a thin TV, some trade-offs had to be made, and one of them must have been screen uniformity. The left and right sides of the picture are clearly brighter than the rest of the screen. It’s the sort of thing that, if detected, can really stick in your craw. With that said, this TV does everything else very, very well. And with a street price living in the neighborhood of around $2,500 right now, it will likely appeal to a broad range of buyers who want top-notch features and performance in a stylish package for under $3,000.